Electrical component test systems often need industry-specific components to complete the test system. Low-power components can often be tested with straightforward signal conditioning for connections to data acquisition hardware. 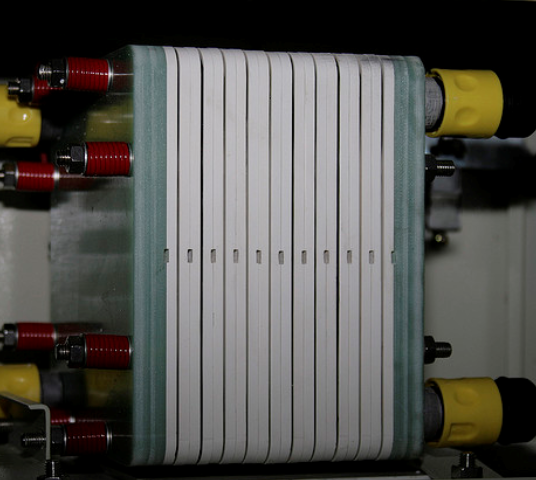 For example, testing battery or fuel cell stacks up to a few 10s of volts can be handled with isolation modules which offer common mode rejection. For high-power components, the signal conditioning can involve some potentially large and expensive components. Furthermore, safety considerations become paramount via both proper component selection, guarding, lockout-tagout procedures, and possible shutdown control schemes. These high-power situations also often call for careful design of signal grounding and shielding to reduce noise on the measurement signals. We develop custom automated test systems to test electrical components and systems. From high-voltage power supplies, to industrial-grade UPSs, high-power capacitors to electric motors, from power meters to fuel cells, and from power conversion switches to regenerative blowers, we’ve tested a lot of different electrical products. Automation available in the measurement instruments – most of the test equipment was automatable, via some combination of serial, GPIB, or Ethernet interfaces. Furthermore, some equipment, such as an oscilloscope, had the ability to store and recall setup configurations. The test operators already used these configurations to decrease setup time for the next test step. Most test equipment did not have automated setup. Operator time spent on each test step – the client had been through a Lean assessment and had already done a good job of timing operations. However, we specifically noted that the operator was manually connecting to the test points and manually transcribing to paper the measurement results from instrument displays. 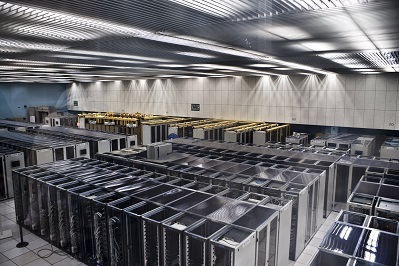 Automating the connections – many types of product models were being tested at this test system. Connecting the test equipment to all sorts of products would require either 1) many types of test harnesses and connectors or 2) a redesign of the products to make test connections simpler and quicker. The enhanced automated test system included automation of instrumentation interfaces, a test executive to run the test sequences, automated test report generation, and automated test data archiving for the electronic UUT. Reduced total test time across several products by an average of ~25%. Time to create paperwork was reduced by ~2/3 due to automated data collection. Configurable automated test steps associated with each type of measurement instrument. The test operators would create a sequence of steps to setup each instrument and record the resulting measurement. The sequence of steps could be saved and recalled for each product to be tested, so the instruments could be used automatically. New programmable meter – integrated the new DMM meter with a programmable interface to replace the one that was not automatable. Foot switch integration – Since the connections to the test points were manual, a foot switch allowed the operator to take the measurement and advance to the next step. The StepWise platform managed the multiple test procedures created for the different products. StepWise also handled creation of HTML reports for every part tested. Micro Instrument, an automation vendor that builds test and validation stands, has extensive experience with programmable logic controllers (PLCs) and stand-alone controllers for controlling repetitive motion, safeties, and other “environmental” parameters such as pressure and temperature. The company typically uses PLCs to reliably deliver discrete I/O control and standard PID loop control. However, Micro Instrument’s customer, a major automotive company, was interested in investigating fuel cells as a power source and they needed to run these fuel cells under a wide range of conditions for extended durations, for both design validation testing and durability testing purposes. Furthermore, the client wanted to implement more advanced control algorithms than simple PID. The customer knew they needed control loops that predicted system response so we could eliminate overshoot and/or achieve a faster approach to a setpoint. But, because the customer did not know in advance exactly what such “smart” controls would entail, it was beneficial to have the full power of LabVIEW to develop such controls. Providing this functionality with a PLC would be cumbersome, if not impossible. The customer had some Compact FieldPoint which they wanted to use for this project, so we needed to ensure that this equipment would be sufficient to deliver the required control performance and tolerances. Also, the system needed to conduct PID control in two forms – PWM and continuous control. Importantly, this Fieldpoint hardware had a real-time controller running LabVIEW Real-Time. We developed a flexible control environment using NI Compact FieldPoint and LabVIEW Real-Time to meet the customer’s system control demands. For example, to predict system response, we programmed the Compact FieldPoint to run control loops that were aware of imminent system-state changes and changed their control schemes accordingly. As with most validation test systems, we needed to monitor conditions for safety. New product designs are often operated near the edges of safe operation in order for the designer to understand how the product performs in extreme conditions. For this fuel cell application, destructive over-heating and over-pressure could occur. Both digital and analog signals were watched in real-time to assure operation within reasonable bounds and allow a safe shutdown if the fuel cell ran into out-of-bound conditions. Data collected during the validation tests were saved to a local PC for later performance analysis and anomaly detection. The combination of Compact FieldPoint with LabVIEW Real-Time enabled the customer to run the required custom control algorithms and it surpassed the capabilities offered by standard PLCs. A major manufacturer of very large three-phase uninterruptible power supplies (UPSs) needed better measurement, analysis, and report generation capabilities. Their clients used these UPSs on mission critical equipment, such as data warehouse server farms, communications equipment, and so one. Existing testing procedures used equipment that did not allow for complete simultaneous coverage of all sections of a UPS unit, from input to output. Our client wanted a better understanding of the signals on each of the three phases at various locations within the UPS, especially when power sources were switched or faults were induced. Also, in the prior test procedure, factory acceptance reports were manually assembled for our client’s end-customers, delaying the final sign-off. Finally, since the end-customer might want to run a specially configured test or run a series of tests in a different sequence than some other end-customer, our client wanted to be able to rerun certain types of tests or run tests in a customer-specific order. Thus, the test sequencing needed to be flexible and editable, possibly on the fly. Finally, synchronization between the data collection on all signals was critical to assess functionality, since all 3-phases of the UPS output needed to be in the proper timing relationship. At a high-level, the majority of testing a UPS relies on knowing the reaction of the UPS to changes on the input side (such as a grid power outage) and changes on the output side (such as an immediate heavy load). Thus, many of the tests performed on a UPS deal with power quality measurements, such as defined by IEEE 519 or IEC 61000 series standards, which cover both continuous and transient operation. The StepWise test execution platform was utilized to allow the customer to develop arbitrary test sequences using the application specific test steps developed for the program. Our solution used a cRIO to measure both current and voltage from each leg of the 3-phase power (and neutral) by using appropriate cSeries modules connected to various voltage and current test points within the UPS. The cRIO had enough slots to allow a single cRIO to measure a single UPS. Assessment of continuous operation mainly reviewed the UPS output power quality. Here, it was important to know the amplitude and phase of each leg of the 3-phase power. Synchronous data acquisition between all voltages and current channels was needed for proper timing alignment of collected data points. Assessment of transient operation was often a review of power ripple and recovery time. For example, in the event of grid power loss, a UPS would switch over to backup power, with the result being a small transient created on the output a UPS. Again, the voltages and currents needed to be collected synchronously to assure that event timing was aligned. For increased power capacity, the UPSs could be connected in parallel. When ganged together, the continuous and transient behavior of each UPS needed to be compared to the others, in order to capture the behavior of the entire combined system. Consequently, each cRIO (one per UPS) had to share a clock to enable synchronous data collection across all cRIOs. A timing and synchronization module was placed into each cRIO chassis with one cRIO acting as the master clock source and the others being slaved to that clock. 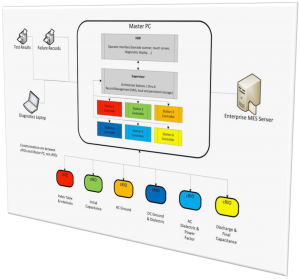 The overall test system architecture has a master PC communicating with each cRIO. Each cRIO was placed in certain activity states by the master PC, such as “arm for measurement”, “transfer collected data”, and “respond with system health”. This arrangement enables the number of cRIO to shrink or grow depending on the number of UPSs being testing in parallel. The test system connected the timing module in each cRIO in a daisy-chained configuration, leading to data sampling synchronization error of less than 100 ns between all cRIOs, which translates to about +/-0.001 degree phase error for 60 Hz power signals. This timing synchronization was more than sufficient to analyze the collected waveform data for power quality and transient structure. LabVIEW was used to create various configurable test steps that could be executed in random order as well as in an automated sequential manner. Our client was thus able to test a UPS in a predefined manner as well as react rapidly to queries from their customer when they were viewing a factory run-off test. For example, the customer might ask to re-run the same test several times in a row to validate consistent responses. Each type of test included automated analysis routines that numerically calculated the relevant parameters against which the UPS was being checked. Not only was this automated calculation faster, but it reduced mistakes and improved reproducibility as compared to the previous post-testing partially manual calculations. Data from all tests, even repeated ones, on a given UPS were archived for quality control purposes and made a part of the device history for that UPS. Finally, the report generation capability built into this test system was far superior to the previous methodology by allowing our client to hand their customer a professional report package practically immediately the testing was complete. Customer satisfaction was improved substantially with this state-of-the-art test system. Our client needed several extremely reliable test systems to test the batteries that power their implantable medical devices. These new test systems were needed for two main reasons. First, the needed to upgrade existing obsolete test equipment, based on antiquated hardware and software. Second, new battery designs could not be tested on the old equipment. 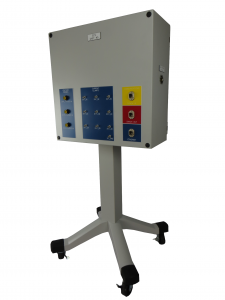 A critical aspect of the new test system was the need to detect any excessive charge being extracted from the battery, thus rendering it unsuitable for surgical implantation. Thus, the test system needed to monitor the total energy withdrawn from a battery during testing to assure that it never exceeded a certain limit while also offering precise control of the type of pulses being drained from a battery. All test results had to be stored in a database in order to maintain device history for each battery manufactured for archiving, quality control, and process improvements. The updated manufacturing test system is PXI-based along with a custom micro-controller-based circuit board for some low-level control. Each PXI controller communicated to the microcontroller (uC) on the custom PCB via CAN. The uC controlled the current drain from the battery while monitoring actual current and voltage from the battery at over 1000 samples per second using a precision 6.5 digit PXI DMM. Additionally, each PXI chassis was used to test many hundreds of batteries. Signal connections were handled by several switch multiplexers. Overall control of all the PXI testers was managed by a host PC connected to the PXI controller. In a simplified view, the testing proceeded by pulsing the battery with a series of different durations and varying amperages. The exact sequence of this pulsing is unique for each DUT model. Measurements were made using a PXI filled with various NI boards such as DMMs, for accuracy, and data acquisition cards, for general purpose use. Additionally, the pulsing amperage levels needed to be tightly controlled in order to know that the tests have been performed properly. Thus, a real-time amperage control scheme had to be implemented to maintain the level requested for the pulse. We chose to accomplish this control via an analog control circuit developed using a custom Viewpoint-developed circuit board. This board was controlled via a Microchip PIC microprocessor. The LabVIEW RT application communicated with the microcontroller to setup the pulsing sequence and coordinate the start and stop of the pulsing and the NI acquisition hardware. This custom circuitry also reduced the overall cost of the test system by about 40%. The engineering time to design this custom circuitry was more than offset by the reduction in material costs because more than 10 test systems were deployed, allowing the non-recurring engineering effort to be shared between many systems. When no critical issues were detected, the waveforms acquired by the PXI system were stored and then analyzed to determine the viability of the DUT. The pass/fail disposition, the waveforms, the total energy consumed, and other test results were then passed along to a master PC that managed all these results in a database for archiving, quality control, and process improvements, each set of results being tied to the unique unit serial number. The test systems provided reliable operation for testing the large annual production volumes of the mission-critical DUTs. Communicate to the host PC – to both receive pulsing instructions and configurations and to return pulse waveforms for each battery tested. Client: A major manufacturer of electrical power generation and distribution equipment. This project involved retrofitting a test system used to verify operation of a high-power capacitor used in electrical power distribution. This system was originally built around 1990. Critical sections of the original test system relied on custom, wire-wrapped analog and digital circuitry to process, analyze, and isolate the high-voltage and high-current signals created by the capacitor. Analog filters, rectifiers, and comparators produced pass/fail status signals. A master PC, other measurement and control equipment, the analog circuits, and a six-position carousel were integrated to create the entire automated test and control system. For each unit under test (UUT), test specifications are obtained from a Manufacturing Execution System (MES) and cached locally. The subsystems at each carousel position are designed to run independently. This parallel capability allows greater throughput and reduced test time per capacitor unit. In addition, as different capacitor models move through the carousel stations, the test parameters and conditions must be aware of the particular model being tested. Test results for UUT are pushed back to the MES system for record retention and data mining. The existing MES interfaces were retained exactly for the retrofit. All capacitors require 100% testing prior to shipment, so the test system is critical for the facility operation. Two or even three shifts are common depending on production needs and the facility cannot afford any significant downtime. Thus, a challenge was to design and build a test system that worked and was very robust. Another huge challenge was the lack of documentation on the existing system, requiring a sizable amount of reverse engineering to understand the test system operation before development on the new system could begin. Furthermore, one of the most important challenges surrounded replacement of substantial amounts of original test equipment before the new test equipment could be installed. Thus, we absolutely had to minimize the time and risk in this upgrade changeover. The architecture chosen was made very modular by the capabilities offered by the cRIO. 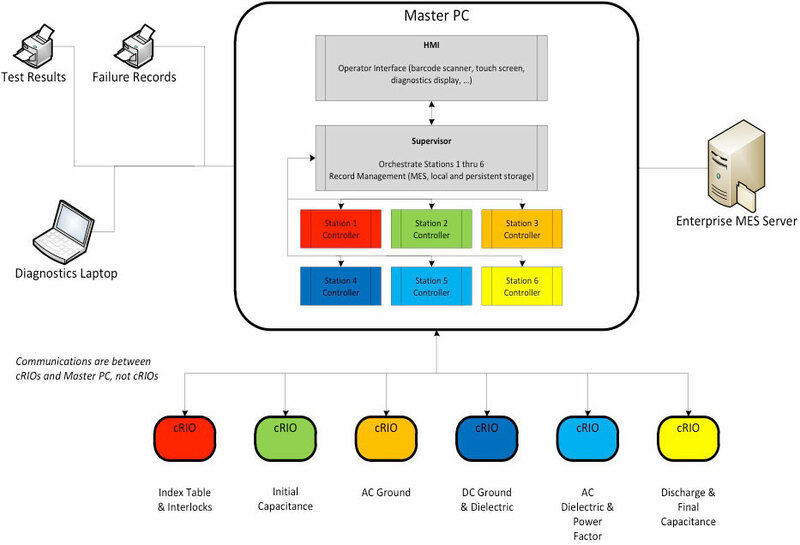 The Master PC interfaced with station-specific measurement instrumentation as needed, such as GPIB controlled equipment, and coordinated control and outcomes from the cRIOs. This additional equipment is not shown in the figure. The Master PC coordinated all the activities including interfacing with the existing MES database and printers at the manufacturing facility. In addition, this PC provided the operator interface and, when needed, access to engineering screen on a diagnostic laptop. The cRIOs were essential to the success of this test system. 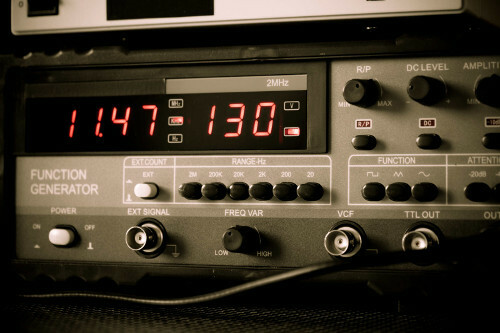 Each cRIO functioned as the equivalent of a high-speed standalone instrument. We were able to duplicate the behavior of the wire-wrapped circuitry by converting the schematic diagrams of these circuits into FPGA code and then tweaking that code to mimicking the actual signals we measured with data acquisition equipment on the original test hardware. The outputs of the circuitry were reconstructed on the FPGA with band-pass filtering, calibration compensation, point-to-point RMS, and phase & frequency functions. This functionality was implemented in fixed-point math and the 24-bit inputs on the A/D provided sufficient resolution and bandwidth for a faithful reproduction of the electronic circuitry. These embedded cRIOs provided a very effective solution to what otherwise might have required another set of costly and rigid custom circuits. Finally, for optimizing the task of replacing the old equipment, we used a set of cRIOs, not shown in Figure 1, to provide Hardware-In-the-Loop (HIL) simulation of the manufacturing and measurement equipment. These cRIOs imitated the rest of the machine by providing inputs to and reacting to outputs from the embedded cRIO controllers, thus supporting comprehensive verification of the new test system before the tear-out of the existing hardware. Furthermore, these HIL cRIOs enabled fault injection for conditions that would have been difficult and possibly dangerous to create on the actual equipment. If you’re looking for an electrical test system, reach out here to chat with us.